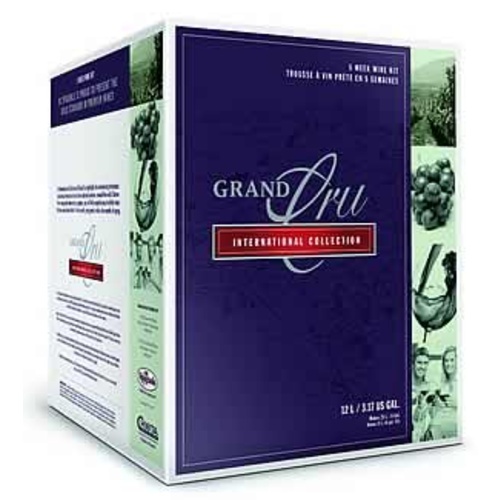 Grand Cru is the best Sangiovase wine kit available. Have made it a number of time and never disappointed! Many comments from friends that this is an excellent full bodied wine. Have ordered it before and like it very much. Is was a gift for my son in law. He loved it and couldn't wait to make the wine. My go to wine kit! I have now made four batches of this variety of wine. It is one of the best and everyone seems to like it more than the other types we have made. I would recommend this if you like a nice hearty dry red! Excellent flavors and wonderful for sipping in the summer. Aged it in a 6 gallon carboy for 18 months using 3 oz. of French oak cubes. Served it at my daughter's wedding. People loved it and so did I. This is my second batch. I recommend this wine. Overall a really great kit. Has grape skins and oak chips, both impart a lot to the wine. Great value. Would recommend it to anyone wanting a good kit wine. I bottled it last Sunday ,so about 7weeks start to bottle. When we tasted it was a little raw but not as bad as I thought it would be. I think this batch will get ready pretty quick. That's the reason I make this one, it gets ready quick and taste dann good for what it is. This was actually shipped to me three times. The final shipment was "perfect" (first one leaked in transit, second one was repackaged and also looked like it leaked). As always, customer service took care of me on this!!! Having experience with wine kits, I used a different yeast strain than the packet sent with this kit. I used BM45 and let me tell you, fermentation lasted a LOT longer than the week it usually does---it went on for almost 2 weeks! I am about to transfer it to secondary...therefore I am not able to give a complete review of the rest of the process or product; HOWEVER, this kit looks like it will be better than the bottom line WinExpert kit and that Sangiovese is one of the best kit wines I've made (which happened to be my first wine kit and is still a favorite--unless this kit takes that spot over). I'm excited to see how the different yeast than the one provided will enhance the flavor as well as the actual fruit that was included with this kit (for more tannin/color/body).